Roughly 94% of Maine's forest land is privately owned, and more than half of that land area is open to the public. In total, landowners voluntarily open up more than 10 million acres of working farms and forests. This access is an incredible gift, and in order to preserve it, everyone who ventures outdoors needs to understand the contribution that landowners make. Most private landowners are happy to allow outdoor recreation, including hunting and fishing, on their land, as long as their property is treated with respect. But it's important to remember that the private land you use for recreation belongs to someone else, just as surely as your car or home belongs to you, and accessing it is a privilege, not a right. Accessing private land: there's the law, and then there's the unwritten rule. 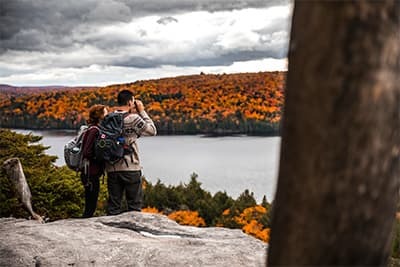 The law - Unlike most other states, Maine operates under an implied permission structure, meaning that if land is not posted, it is legal to use the land. The unwritten rule - Always ask permission. Hunting, fishing, or otherwise using private land without the owner's permission is a careless move that puts everyone's future access at risk. When venturing into the Maine woods, follow the unwritten rule. Always ask for permission, whether or not there are signs on the property requesting that you do so, and regardless of who owns it (a private individual or a business). If you have identified a land area you'd like to access but you're not sure who owns it, you should be able to find that information at the municipality's Town Hall. Then, look up the person or business's contact information, and give them a call. With a little resourcefulness and a Google search bar, you shouldn't have any problem navigating this process. When mapping out where you'd like to go, keep in mind that railroad and utility corridors are not public rights of way and still require landowner permission. Also, don't be afraid to reach out to landowners who have posted their land. You may be pleasantly surprised at how many of them will allow access to someone who has the courtesy to ask first. Learn what matters most to the landowner and abide by all special requests they make, including where you can or cannot drive or park a vehicle, and which specific activities are allowed. Some landowners may require permits for certain activities. If so, respect that request. Look at any such requests from the landowner's point of view, and act with their best interests in mind whenever you use the land. Some landowners dread various seasons of the year, believing the associated activities limit their use of their own property. It's your job to make sure whoever owns the land you're using never feels that way. If we as a recreational community can't respect landowners' wishes, we can only expect more private land to be closed to public use. Provide detailed information. If requested, give the landowner your name, address, phone number and vehicle description, and consider using pre-printed Landowner/Land user Courtesy Cards (PDF). Good, thorough communication is a great way to build mutual respect. Know your boundaries. Learn the geographic property boundaries of the land you have permission to use and stay within them. 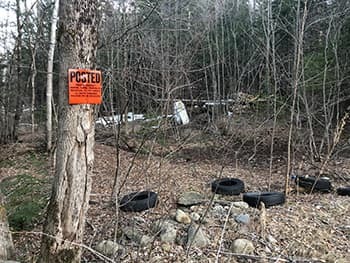 There is no excuse for trespassing — it's a crime enforceable by all state, county, and municipal law enforcement officers, and if convicted, you may lose any license issued by the Maine Department of Inland Fisheries and Wildlife. Keep it clean. Remember that you are a guest. Always leave the land as you found it, if not better. If you see trash that someone else left, pick it up. Keep it legal. Always obey the law, be safe and ethical, and report any land abuse that you witness. Land abuse is a very serious problem in Maine, and each year, access to private property is lost because of it. Put yourself in the landowner's shoes and help ensure that violators are prosecuted. If you see a violation occurring, contact Operation Game Thief at 1(800) ALERT-US [1(800) 253-7887]. Say thank you. Thank the landowner for the opportunity to use their property for recreation. They'll love hearing that you enjoyed it, and that you recognize and appreciate their generosity. When using someone else's land, it's important that you know the laws — both so that you don't inadvertently break one, and so that you can recognize and report violations when you see them. This brief summary has been edited for readability, and is not all-inclusive. For the full text version, refer to Titles 12, 14 & 17A*. Tree damage - Damaging or destroying a tree on another person's land by inserting any metallic or ceramic object into it. Unauthorized tree stands - Erecting or using a portable or permanent tree ladder or stand on another person's land without permission from the landowner or the landowner's representative. Discharging your weapon too close to a building - Discharging a firearm or crossbow within 100 yards of a residential dwelling or building used to store livestock, machines, or harvested crops without the permission of the owner or their representative. Crop damage - Trampling or destroying any crop. Littering - Throwing, dropping, depositing, discarding, dumping or otherwise disposing of litter, in any manner or amount. Structural damage - Damaging or throwing down any fence, bar or gate, leaving a gate open, breaking glass, damaging any road, drainage ditch, culvert, bridge, sign, or paint marking, or doing other damage to any structure. Forest product damage or theft - Cutting down, destroying, damaging, or carrying away any forest product, including logs, pulpwood, veneer, bolt wood, wood chips, stud wood, poles, pilings biomass, fuel wood, Christmas trees, maple syrup, nursery products used for ornamental purposes, wreaths, evergreen boughs, or seed products, as well as any ornamental or fruit tree, agricultural product, stone, gravel, ore, or goods or property of any kind. Unauthorized harvest - Including harvesting Christmas tree and evergreen boughs, cutting firewood, and motorized gold prospecting without a landowner's permission. Whether or not the property damage was intentional, the offender still may be liable to the owner for 2X the owner's actual damages, plus additional costs that could include attorney's fees, court fees, and the value of the owner's time spent on the enforcement proceedings. The owner's damages may be measured either by the replacement value or cost to repair the damaged property. Litter disposal damages include the direct cost of proper disposal, including obtaining permits, plus the cost of any site remediation undertaken because of the litter.